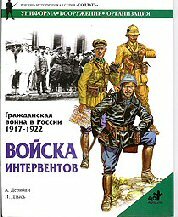 The Russian Civil War,Gauntlet Publications,wargaming,AZT Books,Red Army,White Army,White Armies,Nationalist Armies, Interventionist Forces,Trans-Dnepr,Wrangel,Kornilovski,Russian Imperial Army,Suvorov. We now publish a range of collectible books previously available from Gauntlet Publications in the USA . 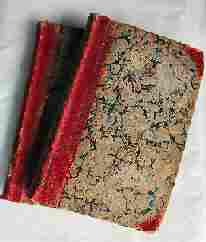 These card covered, thermal bound volumes primarily concentrate on the various opposing forces in the Russian Civil War, though some titles do cover the French Revolutionary/early Napoleonic period. The books include details of campaigns, battles, uniforms and equipment (including tanks and aircraft). They provide an invaluable data source on hitherto obscure subjects for historians, wargamers and modellers. 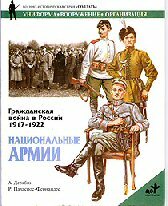 A translation of an out of print Russian volumes covering the bloody Civil War which followed the 1916 Revolution. 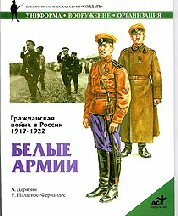 Provides full details of the The Soviet Red Army and its formations, and includes full colour plates illustrating flags, equipment, and uniforms, plus a selection of black and white photos. Translation and reprint of AST original. A translation of an out of print Russian volume covering the bloody Civil War which followed the 1916 Revolution. Provides full details of the White Armies and formations, and includes full colour plates illustrating flags, equipment, and uniforms, plus a selection of black and white photos. Translation and reprint of AST original. A translation of an out of print Russian volume covering the bloody Civil War which followed the 1916 Revolution. Provides full details of the Allied Interventionist Forces including those of the German and Austro-Hungarian Empire, Ottoman Empire, United States, United Kingdom, Canada, France, Italy, Greece, Rumania, Poland, Japan, and China. Includes full colour plates illustrating equipment and uniforms, plus a selection of black and white photos. Translation and reprint of AST original. A translation of an out of print Russian volume covering the bloody Civil War which followed the 1916 Revolution. Provides full details of the Nationalist Armies including Estonia, Lithuania, Byelorussia, Ukraine, Azerbaijan, and Georgia, plus Czech and Polish forces. Also includes full colour plates illustrating equipment and uniforms, plus a selection of black and white photos. Translation and reprint of AST original. This is the next in Alexander Deryabin's series of fine studies regarding the Russian Civil War. 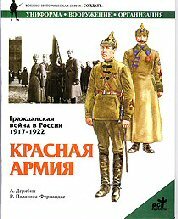 This is a 44-page softcover volume with 8 colour plates illustrating 24 uniforms, soldiers and officers of the various White Armies that fought in the Northwest of Russia plus organisational charts/Orders of Battle. Now completely in English language. A4 format, 44pp, thermal bound, 8 colour plates, 9 b/w photos & drawings. A superb book by the master Russian Civil War researcher - Alexsandr Deryabin. He has put together a masterful study detailing uniforms, equipment, and campaigns. 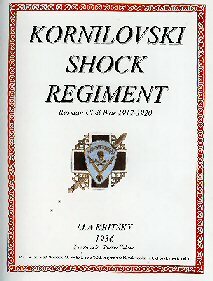 Soft cover, with 8 colour plates illustrating the uniforms of 19 soldiers and officers plus collar badges, shoulder boards, insignia and other detail. Now completely in English language. A4 format, 38pp, thermal bound, 8 colour plates. A fascinating, specialist guide for wargamers and military historians providing detailed organization, orders of battle, maps, and accounts of the operations of French, Greek, Romanian, Polish, Czech and German interventionist forces in the Ukraine. 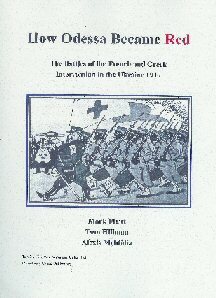 Also provides full details of the Red Army as well as each aspect of the campaigns. Co-authored by Alexis Mehtidis. 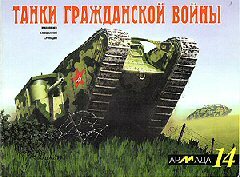 Russian Civil War Game Guide No. 1. A detailed look at a very interesting operation which included opposed river crossings, tanks assaults on a fortified city and mass cavalry battles. Unlike so many books about military operations it gives both sides of the story. 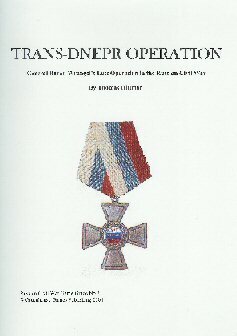 Includes chapters on the following: Wrangel�s Last Offensive, Marshal Blucher, the Liquidation of Wrangel�s Trans-Dnepr Operation, the Battle of Kakhovka, Kornilovskis and Drozdovskis. The Budenny Myth, Armored Trains, The Air War over the Dnepr, Orders of the Red Army Supreme Command and the South Front, Leaders, Order Of Battle, and more. Russian Civil War Game Guide No.3. 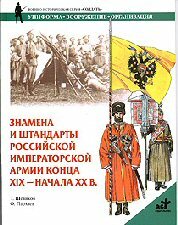 A translation by Lt. Col. Thomas Hillmanfrom M A Kritsky's Russian original of a complete history of the most famous regiment of the Russian Civil War, from its founding, to the evacuation from the Crimea. The book deals with a few myths about the Kornilovskis. In forty months from June, 1917 to November, 1920, the Kornilov Regiment (which later became a division) fought more than 570 battles against the Bolsheviks, losing more than 48,000 men and women killed or injured. Russian Civil War Game Guide No.4. Tom Hillman's translation, extensive commentary, additional research, and supporting graphics are provided completely in English This is the definitive volume on the subject and takes into account all known sources. 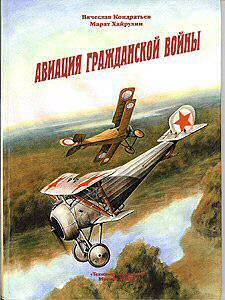 Supporting text, colour, and black and white graphics provides the reader with everything neccesary to understand the roles played by aircraft in the Russian Civil War. Amongst the types featured in 11 pages of colour are Nieuports, Sopwiths, Avros, De Havillands and many more - 48 individual aircraft in total. 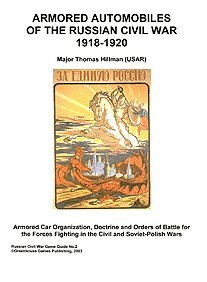 The pre-eminent study of Armored Automobiles of the Russian Civil War and the Soviet-Polish War. The author describes the organization, doctrine, and orders of battle of the Bolshevik Reds and the White Russian forces, plus the Czech, German and Polish armies, enabling historians and wargamers alike to understand and appreciate the steel monsters of the period. The volume features numerous contemporary black and white photographs and diagrams, plus colour photographs of model vehicles used in the Civil War. Russian Civil War Game Guide No.2. 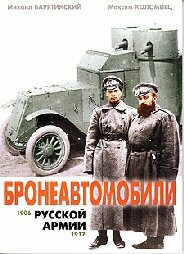 A pictorial study of early armored cars in Russia. The section on Austin cars shows one nearly identical to the armored car that sits outside the Museum of the Revolution in Moscow. Russian soldiers feature in nearly every picture providing guidance on World War I uniforms in some detail. There are 4 full colour plates illustrating uniforms, vehicles and badges. The text is predominantly in the Russian language, with photo captions and key text translated into English by Alexei Rozygraev. A study of the tanks, many of which were acquired or captured from the Allies, used by the Soviet armies. The book includes 144 black and white photographs and a number of line drawings. There is additional commentary throughout the text from translator, Tom Hillman, clairfying points made by the original authors. The card covers feature three full-color plates (inside front, inside back, and outside rear cover) with profiles of numerous machines plus examples of tanker uniforms. 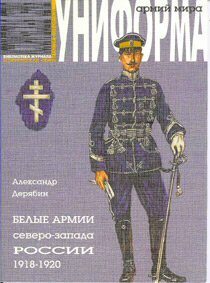 A series of translations of out of print Russian volumes featuring uniforms, insignia and flags of the various Russian forces immediately prior to, and during the Civil War. This volume includes detailed text explaining the design and raising of the flags, and actions in which they were used. There are numerous colour illustrations, plus black and white photos of items in the collection of the State History Museum in Moscow. Artwork is by O. Parkhaev. Translation and reprint of AST original. Another in the fine series of AST Russian publications, now available in English. The Italian and Swiss expeditions of 1799 and 1800 were undertaken by the Russian commander, Alexander Suvorov against French forces in Piedmont and Switzerland as part of the Italian campaigns of the French Revolutionary Wars in general and the War of the Second Coalition in particular. With eight colour plates showing uniform details, the book includes details of tactics, orders of battle and campaign map plus numerous other illustrations throughout the book. Readers should note that some of the colour plates are not bright. This is due to the quality of the original Russian scans.